Scheduling meetings with multiple people can be a pain. Finding time between a maze of competing schedules is frustrating at best, and Microsoft is trying to make that a little bit easier with a new tool the company released Thursday. FindTime is a tool from the Microsoft Garage that ties into Outlook and helps people set up meetings with anyone they need to get in touch with. Here’s how it works: Organizers write an email, launch the FindTime add-in from Outlook Online, Outlook 2013 for Windows or Outlook 2016 for Windows, and then select all of their available times for a meeting. After that, the system sends all of the people included on the email a list of available times that they can vote on. Recipients can vote to show when they’re available, when they’re unavailable, and what times they would prefer to meet, alongside a list of how other invitees have responded. 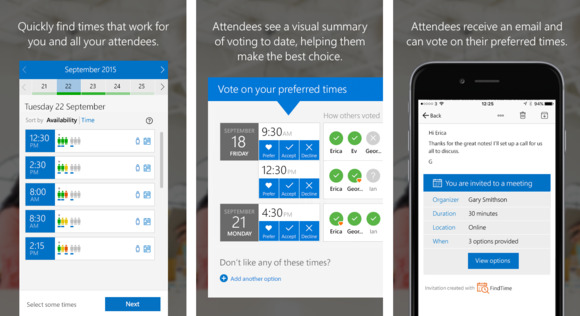 If none of the suggested meeting times work, recipients can add new ones for other people to vote on. Once all of that is taken care of, the organizer can then generate a meeting invitation with one click that goes out to everyone so they can easily add the final meeting to their calendar. Right now, FindTime requires that organizers have an Office 365 subscription, but that isn’t necessary for people who are receiving invites through the system. If there’s one downside to the system, it’s that organizers need to either access it through Outlook Online or Outlook for Windows. It’s not clear if it will be making a cross-platform jump, however. It’s interesting that Microsoft launched FindTime as a separate product rather than extend the reach of Invite—an application it launched earlier this year that performs a similar function on iOS.